The Harlem Globetrotters bring their all-new fan-powered world tour to Lowell & Worcester, MA and Manchester, NH in February & March 2019. Committed to bringing fans the best experience and most electrifying athletes on the planet, the Harlem Globetrotters will give their fans a chance to get closer than ever to the action and team’s stars with their brand-new Fan Powered World Tour. 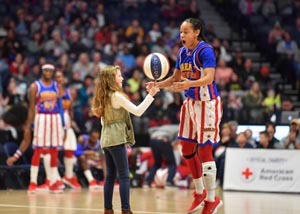 Prior to every performance, fans can secure a ticket to Magic Pass, the Globetrotters’ exclusive pregame event. Magic Pass gives fans unprecedented access to the stars of the team, an opportunity to learn tricks, shoot hoops and take pictures on the court. The Harlem Globetrotters® are legendary worldwide, synonymous with one-of-a-kind family entertainment and great basketball skills for the past 93 years. Throughout their history, the Original Harlem Globetrotters have showcased their iconic talents in 123 countries and territories on six continents, often breaking down cultural and societal barriers while providing fans with their first-ever basketball experience. DCU Center in Worcester, MA on March 23rd for TWO games at 2:00 pm and 7:00 pm.